Youth Justice Awareness Month (YJAM) started back in 2008, when Tracy McClard, a mother from Missouri who lost her son to suicide in an adult jail, organized a 5K race in October to raise awareness about the harmful practice of treating children as adults in the criminal justice system. Each October since then, YJAM has seen more activities and more events highlighting what is wrong with trying kids as adults. Film screenings, panel discussion, art exhibitions, and more ambitious endeavors like Tracy’s bike ride across the state of Missouri last year, have all drawn attention to and helped build a growing consensus that we need to reform the way we approach youth justice. During the month of October, allies throughout the country come together to engage their communities on youth justice issues, particularly the harmful impact of prosecuting children in the adult criminal justice system. 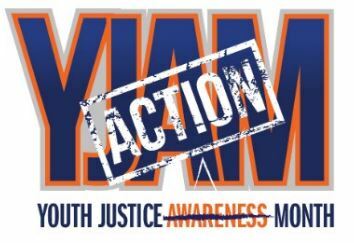 Youth Justice Awareness Month (YJAM) is an opportunity for families, youth, and allies to host community-led actions and events that expose the real-life consequences of children being processed in adult court and placed in adult jails and prisons. With events happening throughout the country, YJAM is not only a time to raise awareness but it is also a time to build collective action, to strengthen relationships with other advocates, and to join local advocacy campaigns working to create policy changes. Every year in the U.S. an estimated 250,000 youth are tried, sentenced, or incarcerated as adults. These young people are our friends, siblings, sons and daughters. Each year, we build momentum to end the criminalization of our youth and the devastating long-term consequences they must face every day. Are you interested in taking a stand for youth justice?